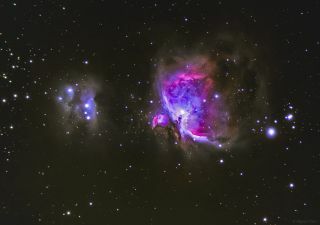 The Orion Nebula, also known as Messier 42 or NGC 1976, is located approximately 1,500 light-years from Earth. Miguel Claro took the photo in Serra de Aire, Portugal near the Mira de Aire Caves complex. He used a portable Vixen Polarie Star Tracker Mount with a Canon 60Da camera and Astro Professional ED 80 telescope to capture the image, which was released to Space.com on Feb. 7, 2014. The Great Orion Nebula glows in vivid shades of pink and purple in this stunning photo taken by an avid night sky photographer , who captured the image using portable photo gear for the first time. Veteran astrophotographer Miguel Claro took the photo in Serra de Aire, Portugal near the Mira de Aire Caves complex. He used a portable Vixen Polarie Star Tracker Mount with a Canon 60Da camera (ISO 2500, exposure: 21s at f/7 with a focal 570mm) and Astro Professional ED 80 telescope to take 51 photos that were then combined in Maxim DL 5. The image was sent to Space.com on Feb. 7, 2014. The Orion nebula, also known as Messier 42 or NGC 1976, is located approximately 1,500 light-years from Earth and spans roughly 40 light-years across. Oxygen and hydrogen gas emission create the vivid colors seen in the famed nebula’s region of star formation. One light-year is the distance light travels in one year, or about 6 trillion miles (10 trillion kilometers). The Orion nebula is one brightest in the celestial sphere and can be spotted with the unaided eye as a bright point near the belt of the three stars in the constellation Orion. Another nebula, Messier 43 (M43), can be seen to the left of the Orion nebula. M43 is a circular-shaped emission nebula appears to be separated from the Orion nebula by a dark dust lane in the foreground of the image. The nebulas are a part of a much larger Orion Molecular Cloud Complex, which includes Messier 78 and the Horsehead Nebula. An interstellar cloud of dust reflecting light from hot young stars can be seen toward the left edge of this picture. This area comprises three regions known as NGC 1977, NGC 1975, and NGC 1973.